Pinterest, the popular pinboard site, will be getting redesigned profile pages and an iPad app in the near future, the company’s cofounder and chief executive, Ben Silbermann, announced at SXSW. Silbermann, speaking at SXSW Interactive, said users will soon see new profile pages that have been redesigned to look "more beautiful," and that will display users' influences more prominently, CNN reports. Silbermann also told the audience that an iPad app is "in the works," though he declined to give a tentative release date. Pinterest is a social network that is based around users' curated pinboards, or image walls. 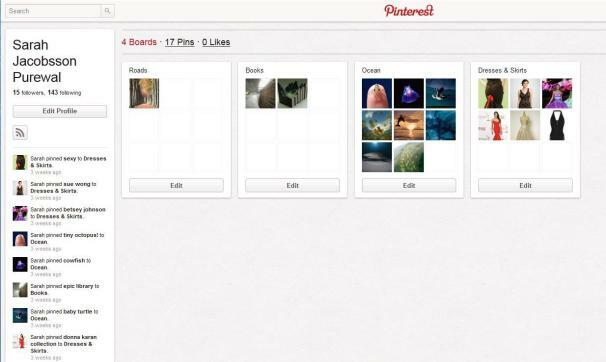 It's sort of like online scrapbooking -- if you see a photo you like on the Web, you can "pin" it to one of your virtual pinboards using Pinterest's bookmarklet. You can have multiple pinboards with different themes (such as "pretty curtains" or "party dresses" or "LOLcats"), and you can browse other people's pinboards and re-pin items that you like. Pinterest has notably garnered a lot of attention from the female sector -- Internet tracking firm comScore estimates that 68 percent of Pinterest's 11 million unique monthly users are women, and these women drive 85 percent of the traffic on the site. The current profile page on Pinterest are blocky and uninspired. Pinterest was launched in late 2009, but had fewer than 10,000 users for the first nine months. Pinterest took off in mid-2011, and saw 11 million hits in one week in December. It's this sudden surge in popularity that's likely driving the company's decision to redesign the profile pages and launch the iPad app. I'm definitely interested to see what Pinterest decides to do with its profile pages. While the pinboards on Pinterest are very attractive and minimalist (and no doubt driven by the curator's hand-picked images), the profile pages are blocky and uninspired, displaying users' pinboards in a plain, gray-and-white grid style.